Housewife Catherine Lim drives a Chrysler Grand Voyager, one of the biggest MPVs in town. "I may be small, but I like big cars. You sit high and you feel in control," says the bubbly 46-year-old mother of two, who is 1.54m tall. Her previous rides include sport utility vehicles such as the Mercedes-Benz ML350 and Lexus RX300, as well as a Grandis, a full-size MPV from Mitsubishi. Before the arrival of her second child three years ago, Mrs Lim felt it was time for a seven-seater with sliding doors. She reckoned it would be more convenient "with the baby-seat and all". "Initially, I looked at the Toyota Previa," she recalls. "I was even considering a Mercedes Viano. But my husband Djames suggested that it was way too big and like a minibus." Finally, it was a one-year-old Grand Voyager, which had clocked less than 5,000km, that caught her eye. The 3.8-litre V6 with electric sliding doors was a senior management car at Chrysler's office here. "I knew for sure that it was very well maintained," Mrs Lim says. What clinched the deal was "a very special price" from the Chrysler agent. The car also had a fairly high open-market value of about $47,000 - that meant a low depreciation rate. Not wanting to miss out on a bargain, she promptly signed on the dotted line. Her timing could not have been better. This was back in 2010, just before COE premiums shot through the roof. She declined to reveal the price she paid. "It's a secret," she says in a playful whisper. Mrs Lim says she was a little worried about the size of the car at first. "But luckily I got used to it within a week. The front and rear sensors also made parking easier." She also liked the car's "walk-through" feature between the second-row seats. Josh, her 10-year-old son, was fascinated by the aircraft-style overhead air-vents and DVD screens at the front and rear, which kept him and his sister Joey, three, entertained when journeys were longer than usual. Apart from her routine of ferrying the children to and from school and tuition sessions, Mrs Lim says the car is "great for extended family outings". "There's lots of space for everyone," she adds. "I even helped a good friend move house with my car." The Voyager has a neat Stow 'n' Go feature that allows the second- and third-row seats to fold flat, creating a 4,100-litre van-like cargo space. Even with all the seats up, the boot supposedly retains 934 litres of stowage. 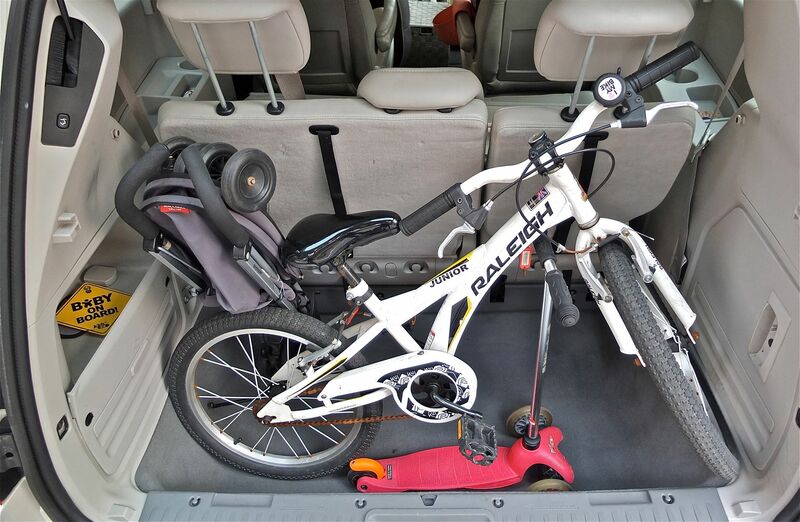 It accommodates the children's bicycles easily. It is not all good, though. Mrs Lim points out that the battery has gone flat twice. And the engine warning light has been on the blink. "I'll be sending the car back to the agent to check," she notes. "It's due for servicing soon." As the Voyager is a heavy car (2.2 tonnes) with a big engine, she confesses that "petrol consumption is horrible" - just 5km a litre. "Perhaps it's because I do mainly town-driving," she says. Otherwise, the Chrysler has served her well. "It's super comfortable and has super shock absorbers. It's even more comfortable than an S-class (Mercedes' flagship) on long drives," she claims. The family has driven it to Malacca and Kuala Lumpur "a few times". Would she be swopping it for something else? "Oh no, COEs are still too high," she says with a laugh. "Besides, I love my macho mummy van." •The writer is a contributor to Torque, a motoring monthly published by SPH Magazines.